The Kia Sorento is ready for everything you do, whether you’re out for a night on the town or a weekend getaway, it’s primed. Its premium interior and a powerful engine take style and performance to a higher level, enabling you to get up and go at a moment’s notice. The Sorento’s standard 185-hp 2.4L GDI, available 240-hp turbocharged 2.0L GDI or 290-hp 3.3L GDI V6 engine systems all deliver outstanding performance. Sorento also provides a remarkably smooth, quiet ride and precise handling, thanks to its unibody design and independent suspension. Sorento’s advanced all-wheel-drive system continuously monitors driving conditions and anticipates traction requirements, allowing you to explore a variety of roads with complete confidence. AWD is complemented by a six-speed Sportmatic transmission that operates with seamless efficiency. The new Sorento is designed to provide you with a truly luxurious driving experience, beginning with streaming audio when using a compatible Bluetooth device. Available premium features include an Infinity surround-sound audio system with 10 speakers, a Supervision meter cluster with high-contrast graphics, and a voice-command navigation system that delivers continuously updated highway conditions from SiriusXM Traffic. Plus, the interior’s soft-touch surfaces reflect refined and contemporary styling. Sorento’s spacious interior is complemented by a variety of seating configurations. Split-folding second-row seats let you carry passengers, cargo, or both. Available third-row seats allow Sorento to accommodate up to seven passengers, or fold flat for increased cargo area. Thoughtful features such as available sound-insulating laminated glass help provide an exceptionally quiet ride. A long list of technologically advanced features, including available systems like Advanced Smart Cruise Control and Blind-Spot Detection with Lane-Change Assist, inspire confidence and enhance your everyday convenience. To learn more about the new Kia Sorento in or around High Point, visit or call us at (888) 980-9494. You can also browse the amazing selection of new and pre-owned Kia models online any time. 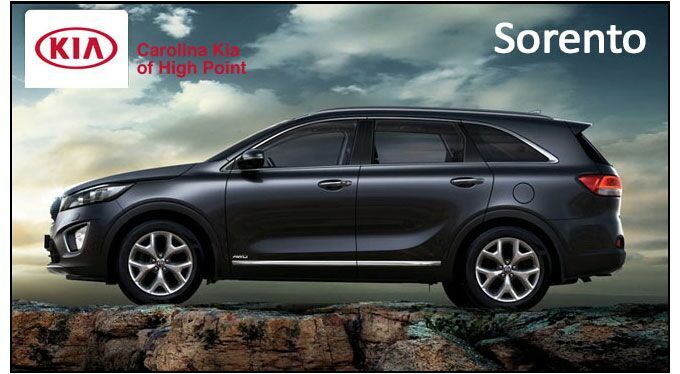 With the largest selection of new and pre-owned Kias at everyday low prices Carolina Kia is the place to shop for your new Sorento. We pride ourselves on customer satisfaction and service and have earned multiple Presidents’ Awards for customer service and satisfaction. We love our customers and our community and devote ourselves to giving back to both. We have incredible member benefits including complimentary oil and filter changes, tire rotations, car wash with every service, discounted accessories, seasonal multi-point inspections, loyalty reward points, courtesy shuttle, and more! Visit Carolina Kia today.